This program will be taught within a "retreat" environment. Literature about transpersonal psychology will be presented, along with transpersonal research studies that explored treatment outcomes of EMDR as a transpersonal therapy, as well as the impact of a transpersonal approach to psychotherapy. Energy based healing philosophy and technique as depicted in Eastern and native shamanic spiritual traditions will be taught along side of contemporary western transpersonal developmental theorists such as Wilber, and Rowan. The cultural and spiritual aspects of shamanism, woven into native Hawaiian tradition, will be taught. The role of EMDR therapy in awakening consciousness will be explored as we take the healing of trauma into the realms of a greater cosmic whole in the language of images, sensory experiences, and intuitive knowing. There will be a continuous and flowing process taking participants from the left brain didactic to the right brain experiential, creating an integrated and flowing experience from egoic to expanded awareness. Case presentation and demonstration of the integration of a cross cultural transpersonal approach within the 8 stage EMDR protocol will be utilized. Applications to creating a safe place, resourcing, and emotional stabilization, within the AIP model, will be discussed. Therapists will develop skills of mindful awareness as they learn to identify their own internal feedback mechanisms within which they can recognize resonance within a shared intersubjective field by utilizing alternative ways of intuitive knowing to determine resonance and intervention from an expanded and a grounded egoic perspective, participating in an interconnected flowing dance of information and energy exchange. An authentic Hawaiian priestess will take us through a meditation and ceremony at powerful sacred sites on the Island. Participants who have completed either the live 2 day program Applications of Mindful Resonance to EMDR, or the 4 week online distance learning program Applications of Mindful Awareness and Resonance to Psychotherapy, will find that this program will take their skills to a greater level and open them to the non-ordinary realms of conscious awareness. Participants who have completed other programs in meditation, mindful awareness, or energy based psychology will find this to be an essential adjunct to their current skill base, but is appropriate for any level of training in this area from beginner to experienced. Experiential exercise provides participants with initial internal tools to mindfully track the flow of energy and information, influencing consciousness, and accelerating the healing of trauma within an expanded range of awareness. Skills can easily be applied to hypnotherapy, energy psychology, and somatic processing therapies as well as EMDR therapy. In EMDR practice sessions broken into small groups of three, only trained EMDR therapists will take the therapist role. The role of client, and of transpersonal observer who tracks energy and information within the shared field, can be held by any participant. Due to the length and depth of the program, this is an opportunity to go deep within the experience and within the personal work of transformation. The program includes participation in an evening gathering of drumming, meditation, and ceremony, as in accordance with the policy and permission of the hosting facility. Identify the relationship between science, psychology, and spiritual philosophy as it applies to resonance and mindful awareness, supporting application to EMDR as a transpersonal therapy. Develop skills of meditation and mindful awareness that may be applied within the EMDR protocol. Identify skills of alternative ways of knowing such as inner vision, hearing, knowing, kinesthetic bodily sensations, which can be integrated into a nonlinear EMDR transpersonal therapy. Identify skills of internal intuitive tracking to determine client/therapist resonance as an assessment and healing tool within a transpersonal EMDR protocol. Demonstrate an ability to apply the skills of mindful awareness, resonance, and internal feedback mechanisms for purposes of assessment and intervention within a transpersonal therapy model. Identify the role of the transpersonal therapist healer in modern day psychotherapy, blending western psychology with knowledge of eastern and ancient wisdom cultural traditions within the EMDR protocol. Identify 3 culturally relevant points in the adaptation of a transpersonal EMDR approach creating a universal language within the standard protocol. Irene Siegel, Ph.D., LCSW conducts her integrative psychotherapy practice and teaches meditation and healing in Huntington N.Y. She received her doctorate degree from the Institute of Transpersonal Psychology (now Sofia University) in 2011, her masters in Social Work from Columbia University in 1977, and advanced clinical training through the Long Island Institute for Mental Health in 1983. She studied ancient healing arts throughout North and South America. Dr. Siegel has presented at numerous EMDRIA Conferences from 2000 through the present. She is author of The Sacred Path of the Therapist: Modern Healing, Ancient Wisdom, and Client Transformation and Eyes of the Jaguar and creator of the Labyrinth Series Guided Meditations. Additional info about Dr. Siegel and can be found by clicking here. Hawaii Island Retreat's eco-boutique hotel and wellness spa is a place of intentional peacefulness, set among towering evergreens and ocean breezes along Hawaii Island's North Kohala coast. When you visit Hawaii Island Retreat you quickly realize the wonder of the sacred land. Here, you can relax and unwind on 50 acres of gardens, wild groves, and ancient valley trails. They offer elegant accommodations in their green boutique hotel, green living, and outstanding organic cuisine. You will be offered a choice of elegant suites and yurts. The suites are color matched and named for the large, antique Saxon prints of tropical flowers. Each suite has a spacious bathroom with a large soaking tub and separate shower. These spacious suites are 375 - 450 square feet and decorated with turn-of-the-century-Hawaii furniture. All suites have private balconies and chairs, overlooking the fragrant garden as well as ocean. The yurt bungalows have valley or garden views and allow for a more affordable retreat stay in paradise. The Hawaii Island Retreat is offering a special all inclusive package rate depending on single or double occupancy, and choice of accommodation. All reservations for room and board will be made directly with the Hawaii Island Retreat. They are located at 250 Lokahi Road / 185, Kapaau, HI 96755. Reservations can be made by phone at (808) 889-6336, and email (http://www.hawaiiislandretreat.com/contact-us), about a one hour drive north from the Kona Airport on the Big Island of Hawaii. If you have special needs please contact Frank Capatch at (808) 965-5349 or Email fjchazit@icloud.com. For additional information about this program contact Dr. Irene Siegel at Email irenesiegel@me.com or call (631) 547-5433, ext. 2#. All program fees must be paid first before room and board reservations are made. Space is limited. Please register early. Registration: Early registration is $825 through December 31, 2018. $895 is the full fee for the program only. This includes transportation on day three of the program to local sacred sites on the island. A separate registration is required for room and board at the beautiful Hawaii Island Retreat Center. Space is limited. Please register early. (Schedule is subject to change - All class hours must be attended in order to get credits for the program. No partial credits are given.) All meals are provided by the Hawaii Island Retreat. History of the native Hawaiian culture and healing practices by guest Hawaiian High Priestess Ehulani Stephany. Bus provided to sacred Hawaiian sites. Focusing personal work as we heal our wounds. and future template within a connection of wholeness as inner wisdom emerges. Certificates for 30 EMDRIA credits and 30 CEs are awarded online by ce-classes.com only to those who complete the entire course, sign in and out each day, and submit an evaluation form. Certificates are awarded online after completion of the entire workshop and verification of attendance. Participants who arrive late or leave early will not be eligible for a certificate of completion. A key code will be presented to each participant who has been verified as completing the entire program, and will be used to register at Ce-Classes.com where they can complete the online evaluation and print their certificate of completion. The cost of the CE certificates are included in the registration fee. Ce-classes.com is approved by: Ce-Classes.com is approved by the American Psychological Association to sponsor continuing education for psychologists. Ce-Classes.com maintains responsibility for this program and its content. Association of Social Work Boards (ASWB). Ce-Classes.com, provider # 1142 is approved as a provider for social work continuing education by the Association of Social Work Boards (ASWB) www.aswb.org through the Approved Continuing Education (ACE) Program. Ce-Classes.com maintains responsibility for the program. ASWB Approval Period: 1/5/2017-1/5/2020. Social workers should contact their regulatory board to determine course approval for continuing education credits. Social workers participating in this course will receive 30 clinical continuing education clock hours. The Texas Board of Social Work Examiners, Continuing Education Provider - 5674 expires 4/30/2019. The Texas Board of Professional Counselors, Continuing Education Provider - 1622 expires 2/28/2019. This course is NOT APPROVED for NBCC credit ce-classes.com (click here) maintains co-responsibility for this program and it's content. Licensed professionals should contact their regulatory board to determine course approval. This program is highly experiential aimed at bringing awareness to consciousness itself, and changing the context of experience. This workshop is intended for licensed Mental Health Professionals (Psychologists, Social Workers, Counselors) and is appropriate for intermediate and advanced clinicians. This course provides clinical continuing education credit. This workshop is also appropriate for non-EMDR trained therapists, as well as all levels of EMDR trained therapists. Shapiro, F. (2001). Eye movement desensitization and reprocessing: EMDR, basic principles, protocols, and procedures. (2nd ed.) New York, NY: Guilford. *Grievances must be in writing to Dr. Irene Siegel, and will be replied to within 5 - 10 business days. *Program is in compliance with the American Disabilities Act. 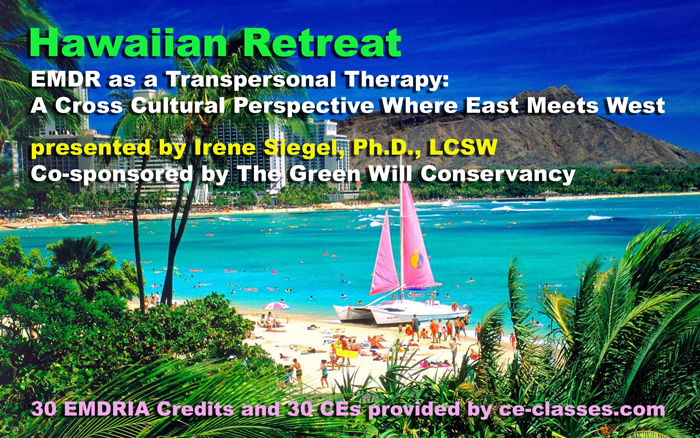 Would you like to arrive a day early at Hawaii Island Retreat and take a one day EMDR refresher class at Hawaii Island Retreat on May 19th, prior to the beginning of EMDR as a Transpersonal Therapy? Master teacher EMDR Approved Consultant, Don deGraffenried, is teaching EMDR Gold Standard Refresher: With Theory and Practice, for 6 EMDRIA credits. This is not a basic training, and you must have completed the Basic EMDR training to take this class. Click here for more information and registration for this one day class. 1. Register for EMDR as a Transpersonal Therapy course in Registration Step 1. 2. Register at Hawaii Island Retreat for room and board or for their commuter rate in Registration Step 2. You must register with Hawaii Island Retreat even if you plan on commuting, or your registration is not complete. Registration is $895 through December 31, 2018. $895 is the full fee for the program only. This includes transportation on day three of the program to local sacred sites on the island. A separate registration is required for room and board at the beautiful Hawaii Island Retreat Center. Space is limited. Please register early. **Cancellation policy: Full refund through December 31, 2018. 50% refund from January 1 - March 15, 2019. No refunds as of March 15, 2019. There will be a $50 charge for all cancelations. Registration STEP 2 - The Hawaii Island Retreat is handling room and board. Please contact them using their email Click Here or telephone (808) 889-6336. **Don't forget to register for accommodations ASAP at the Hawaii Island Retreat. See their cancellation policy, which is different from the program cancelation policy. info@hawaiiislandretreat.com with the following information.